Mine was a an iPhone otome game XD. It was 10 Days with my Devil. I wish they would have it for the PC because I don't like the fact that the iPhone is very small, but I still really enjoyed the game c: . 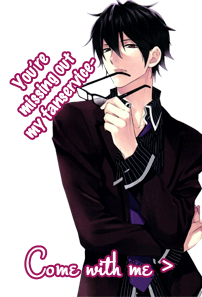 My favorite route was Shiki Kurobane's route. My first otome game was Hiiro no Kakera, though the more I think on it I believe I must have been exposed to Other Age beforehand. In Hiiro no Kakera, I was so ecstatic that I managed to click the right choices to reach Ryou's first CG on my first try. And I loathed Mahiro's voice the instant I heard it. Sorry, whoever voiced him. My first otome game was Fantasia Realm of Thanos, even I already forgot about the story itself. My first otome game was Starry Sky in Spring. I decided to play it after reading an anime review in mal, saying that she doesn't recommend watching Starry Sky if you haven't played the game. Because she said, i won't understand the story. So, I watched the anime. Thinking that I could prove her wrong. Hell I was really really wrong! I did not understand any bit of it. The characters are confusing. From there, I looked for the game and luckily, it has an english patch! My first 2 Otome Games were RE: ALISTAIR++ and Yo-Jin-Bo. But my ultimate favorite as of now has to be Uta No Prince-Sama. wah~ I like utapri too XD who's our favorite, nee? kyuuichii wrote: wah~ I like utapri too XD who's our favorite, nee? I like... Natsuki and Syo in STARISH and Reiji and Ai in Quartet Night! Mine was Under The Moon I happened to see the opening on Youtube and decided to play...little did I know what I was in for! *coughbishie&pr0ncough* Needless to say it changed my perspective on the potentiality of Japanese 'girl games'! Gotta accommodate to everyone's tastes I suppose aye? My first english otome game was Harvest Moon: More Friends of Mineral Town. I played that game when I was 8 years old, and back then I don't know that it was an otome games . And, for My first Japanese otome game was Starry Sky in Summer. Since I can't understand with Japanese characters, so I search it in Google. Fortunately, I found softwares for translated Japan to English (Agth, TA, etc). So I don't have to worry playing all japanese otome game for PC . ...I believe it was Uta no Prince-sama. I watched the animation and looked into it. Once I realised it was a game I got my hands on it as soon as I could (and all the ones that had been released thus far); never regretted a moment, truly. It was just such a roller coaster ride of emotional torment and fun... for a game that looks so "kira kira" in the anime--the back stories for some of the characters are truly morbid. I was (pleasantly) surprised. Frozen Essence(FE)..i'm just started play otome game a few days ago but just PC/Windows version so..i don't many otome game for pc..then someone suggest FE..em..at first i feel so bored to play because there a lot word to read( ) ..but the story is awesome even though the graphic not too great..hihihi..
And, yessshh~ Story can still be awesome and make up for the underwhelming art. hahahaha yeah..like me..at first i kept complaining how long a text which make yawn to sleep and i was nearly give up and end a game..but i wonder why people really love this kind of game so i continue read and play a game even though i was yawn along a game .. but its really worth to play.. i very satisfied play this type of kind..its give 'dokidoki' feeling...hahaha..yeah thats right..that kind of kids play RPG game i guess.. your right ..for me ,this kind of game should be judged by its plot/story not art..
My first I think is Persona 3 with female MC for the PSP (and my favourite guy there is Shinjiro). I mean its not really Otome since it had dungeons also but its sort of Otome. Actually RPG does require a lot of reading and understanding so I'd say the ones who want to skip are probably the action gamers. But either way we can't really judge an entire population of rpg or action players just because of a few I guess. game hehe..i usually skip the reading when played again ( another route) ..but just at the beginning of a game..that romantic stuff..never skip..hehe..i'll always wait for it..
i hope that not sound pervert.